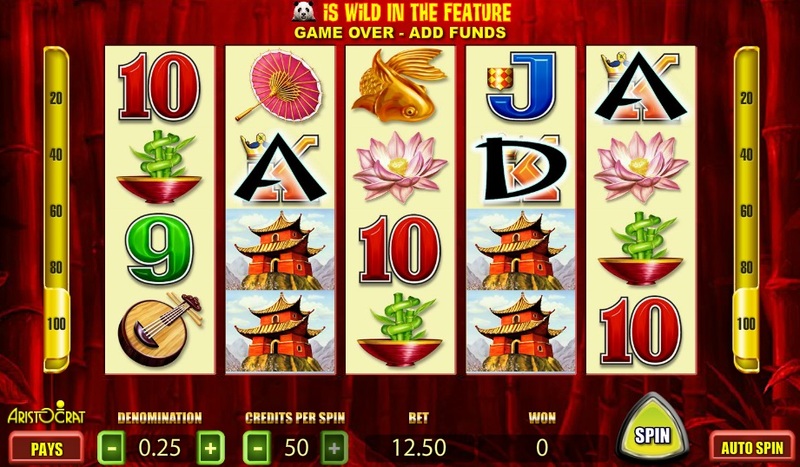 Already a popular land-based casino slot from leading developers, Aristocrat, the online version of their Oriental-themed slot, Wild Panda, hits all the right chords with players, even if the bonus features are a little light on the ground. 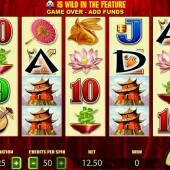 As the title suggests, established slot developer Aristocrat transport us to a world of Koi Carp, lotus blossom, and bamboo plants, parasols and pagodas – in look and feel Wild Panda is very much in the vein of Cherry Blossoms from Next Gen Gaming or the equally sumptuous Asia-fest, Emperor’s Garden, from the same developer. So if you enjoyed those two slots then there is a high chance you will also find it easy to get on with this slot. Betting starts at just $0.01, but with 100 paylines in total this should keep the action fiends happy. However, it’s there that most of the action stops, as the main – or only – feature in the game is a free spins bonus round that is triggered not by Scatters but by spelling out the word, ‘PANDA’, across the reels. You will need to spell P-A-N-D-A in sequence across the reels. The letter P appears only on reel 1, ‘A’ shows up only on reels 2 and 5, the letter N appears only on the third reel, while the letter D can only show up on reel 4. Look out for the regular poker card symbols, as it’s these that house the PANDA letters. The Wild, meanwhile, is the Panda himself, and during free spins, all symbols that spell out PANDA will turn wild. This can lead to some really decent prizes in the bonus game, despite the fact that you only get five freebies to begin with. If you like your bonus features deep and long, forget about playing Wild Panda. Five free spins is not going to float many people’s boats, but with 100 pay-lines I found myself triggering the bonus round fairly frequently, and with the additional Wilds you can bag yourself lots of small, frequent wins. If Asian-themed slots are your thing, there’s plenty of choice out there, but for something involving plenty of small, plentiful wins, Wild Panda could be the slot for you. Let’s just say we don’t think this game will become endangered any time soon.